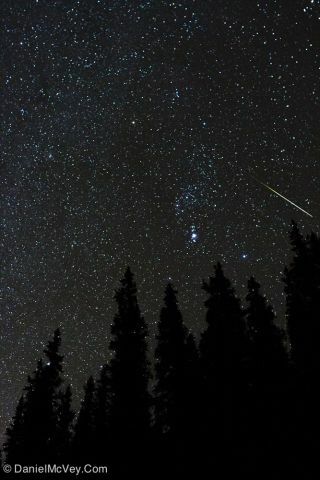 Astrophotographer Daniel McVey took this photo of an Orionid meteor in Summit County, CO, Oct. 21, 2012. The leaves are turning, there's a nip in the air and the Orionid meteor shower spawned by Halley's Comet is at its peak overnight tonight (Oct. 20). If the bright moon or bad weather doesn't spoil the view, stargazers can catch a glimpse of the annual Orionid meteor shower as it reaches its peak late Sunday and early Monday (Oct. 21). The Orionids, so-named because they appear to spring from a region to the north of the constellation Orion's second brightest star, Betelgeuse, are a less impressive version of the Perseid meteor shower that occurs in August. Unfortunately for casual observers, the bright moon - which reached its full phase on Friday (Oct. 18) - may wash out most of the view. Weather permitting, viewers can expect to see at most one shooting star every three minutes. That's about a third as many as are visible in the Perseids or December's spectacular Geminids. "Moonlit skies from a bright waning gibbous moon make this a less than favorable year for viewing," a NASA meteor shower guide for 2013 explains. "However, the Orionids are known for being bright meteors, so there still might be a good show in the early hours before dawn." During tonight's Slooh webcast, viewers can tweet their questions using the hashtag #Orionid. You can also watch the supernova webcast live on the online Slooh Space Camera website and the Slooh iPad App. The shower will be most visible in the hours around 5 a.m. EDT (0900 GMT), when Orion is highest in the southern sky. The Orionids are dim, so astronomers recommend watching far from urban areas. The meteor shower is visible in both the Northern and Southern Hemispheres. The Orionids usually start to appear around Oct. 17 at a rate of about five per hour. The shower reaches a maximum Oct. 19 through Oct. 23, generally peaking the morning of Oct. 21. By Oct. 25, activity has subsided to five meteors per hour. Comets are basically balls of dusty ice, so as the sun melts the ice, the comet trails dust and debris behind, which the Earth passes through twice a year during the Eta Aquarid meteor shower in May and the Orionids in October.